"A funeral doesn't have to bury you in debt!!!" You have the right to buy a casket from any provider you choose. Also, the funeral home can not refuse to receive a casket, or charge you a fee to handle it if you have purchased it elsewhere. This is the Law! Our staff of qualified consultants offer over 30 years of combined funeral, cemetery, cremation, and memorial experience to your family. Speak to one of them FIRST to save both grief and maybe thousands of dollars. Become an Informed Customer! Please contact any of our Affiliates for service in theses areas. Deception has long been a mark of the Funeral Industry. Don't get caught in their web of deceit. CALL US NOW to learn more how to make sure you aren't treated this way also! We now accept PAY-PAL to better serve you! Did you know there is a Patron Saint of Casket Makers??? Click here -choices to honor your loved one who served our Country! All these were previously advertised in every VFW magazine in America! Check out the MILITARY CASKETS category! to make sure everything was as expected. Your professionalism and honesty touched my heart. time of sudden grief!I would highly recommend you and your company to anyone in need!!! you gave me and my family while making my grandmothers wishes come true with a gold accent casket!" that his wish was fulfilled by your company. Thank you again for such a smooth & hassle free transaction. Make your FINAL PLANS here! TOO WEIRD TO NOT BE TRUE!!! LIGHTNING HITS COUPLE IN THE GRAVEYARD!!! We encourage our families to visit their loved ones grave, but this is rediculous!!!! 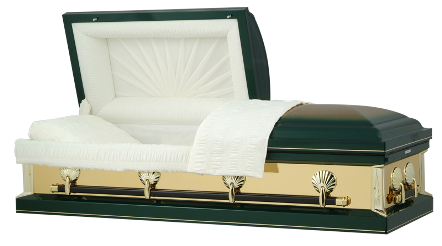 Is the funeral home you are using giving you trouble about choosing a casket online? Need to update yourself on proper behaviour during a funeral? Have you ever considered helping others during their END OF LIFE period? -Connect Check out past columns at www.latimes.com/olshopper. Casket Gallery boasts more than three dozen caskets for less than $3,000. As the site advertises, "A funeral doesn't have to bury you in debt!" The site, at www.casketgallery .com, also sells urns, most of which cost less than $1,000. Shipping costs for caskets vary. Urns cost $15 to ship. In addition to its merchandise, Casket Gallery includes a "cyberspace memorial" on the site. Christine Frey covers personal technology. Interested in or need more casket selections? Do You Have Unwanted or Unneeded Cemetery Property you want to sell? Interested in starting your own retail casketstore, or perhaps becoming an authorized SalesAssociate?